The LPHS bands held their annual Recital Night on Thursday, January 24th. This year was the second year for the event, with both years proving to be a success. 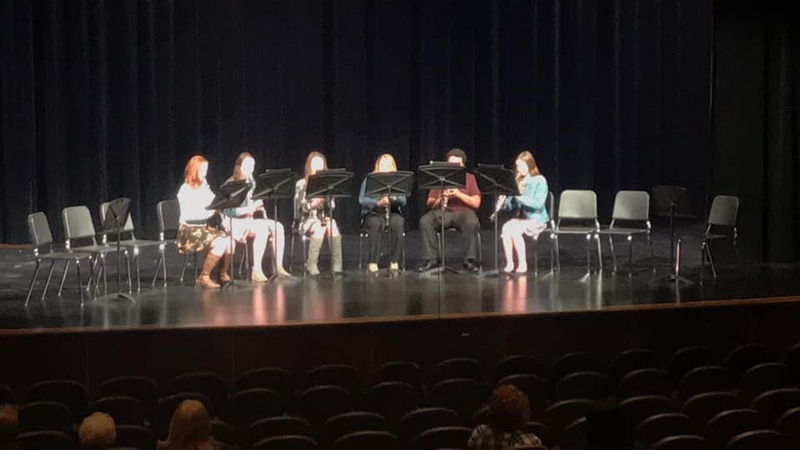 Recital Night is a way to help the band members who go ISSMA Solo and Ensemble in late January every year, playing either a solo or an ensemble in front of judges. Having the Recital Night gives the students going to contest more time to prepare the piece(s) that they will soon be playing for a potential gold, silver, bronze, or participation medal, and it gives the kids who are not going time to get better at their instruments, too. Recital Night makes musicians feel more comfortable in front of their peers, family, and even the band directors who hear them daily. It builds up courage because it is not only mandatory to play in front of a crowd on Recital Night, but the students also rehearsed daily and played in front of their band class. Since ISSMA is an optional event, not all of the band students will be participating in it, so the band directors made the decision to make it a requirement to play either a solo or ensemble for Recital Night. With it being required for all band members to perform on Recital Night, it adds a variety of musicians and makes the night more enjoyable. Solo and Ensemble took place January 26th at Kankakee Valley Middle School in Wheatfield, Indiana.